Can you believe it’s only a couple of weeks until Christmas! I really need to get my house organised – we finally have a tree – but no decorations yet! 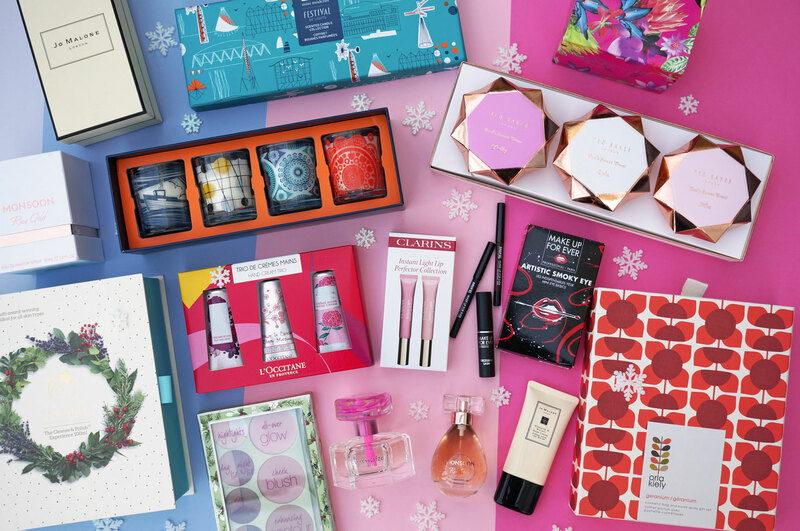 😀 I’m also now starting to publish my gift guides, which I’m kicking off today with a beauty guide including a fantastic selection of gifts under £25.00. Enjoy! 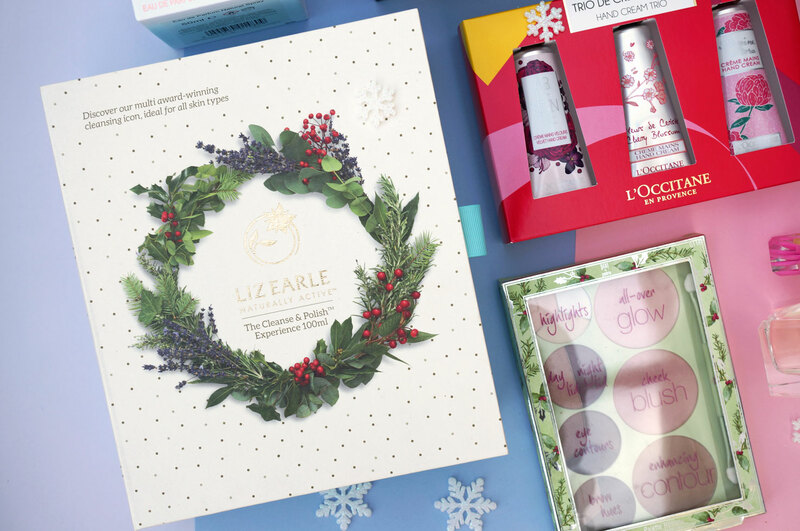 Let’s start with the very festive looking Liz Earle Cleanse & Polish Christmas Set (£15.50) – most people will be familiar with this iconic product, as it’s literally one of the most popular cleansers ever. Did you also know it’s won over 120 awards too! This gift set contains everything you need to get super clean skin in mere minutes – there’s a 100ml tube of Cleanse & Polish Hot Cloth Cleanser, 2x Pure Muslin Cloths, and a Cleansing Guide included, all beautifully encased in a specially-designed luxury Christmas gift box that’s just perfect for gifting. Next we have the Mini Moderns Festival of Light Candle Collection (£26.00) – Ok I know this is over £25.00, but only by a smidge so I’ve allowed it to sneak in this post! 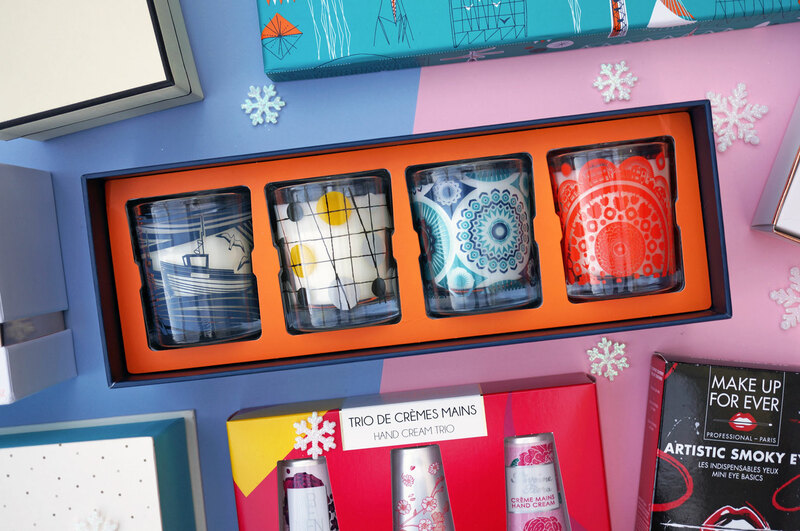 This super cute candle set contains four of Mini Moderns’ classic print designs on four wonderfully scented mini sized candles. 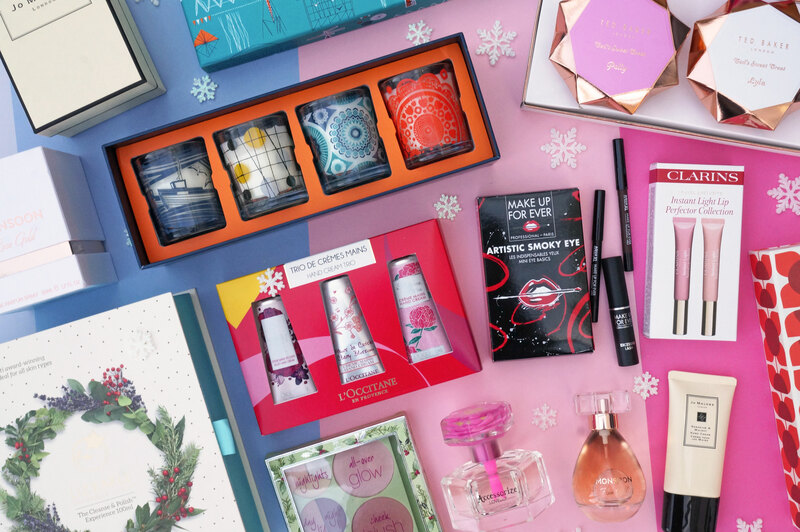 The fragrances included are – Whitby (Sea Spray), Pavilion (Gin Fizz) Darjeeling (Tea and Fig) and Paisley Crescent (Eastern Orange Blossom). 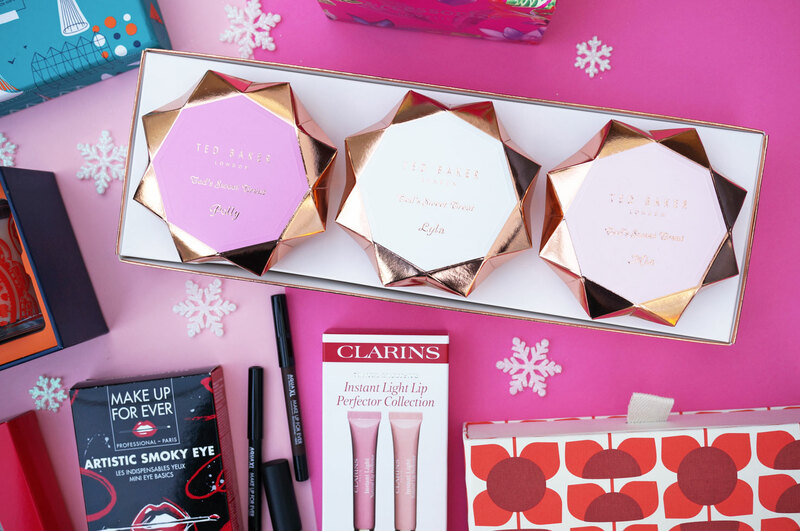 And on to the Ted Baker Sweet Treats Gem Trio Gift Set (£22.50) – I absolutely love Ted Baker for Christmas gifts, they always come up with beautifully packaged goodies, and this Sweet Treats Gem Trio set would make either one fantastic gift, or three individual stocking fillers. 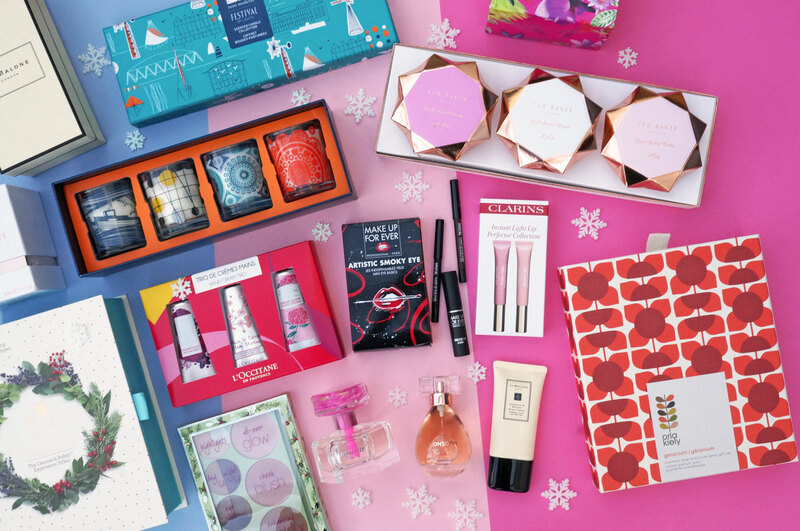 Each ‘gem’ contains a travel sized Ted Baker perfume and a full sized nail polish. The fragrances included are really lovely and wearable, including Mia, Polly and Lyla scents – perfect for any girl who is constantly on the go. 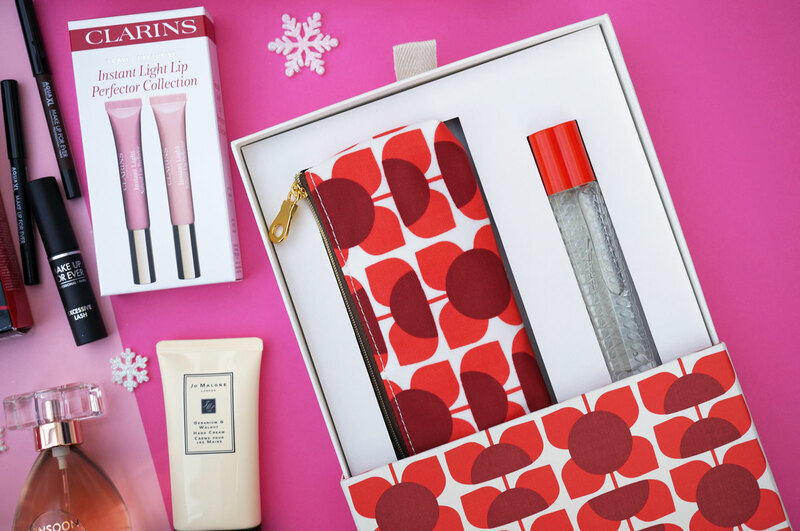 Next we have the Orla Kiely Geranium Purse Spray Gift Set (£22.00) – This beautiful set from Orla Kiely includes a mini cosmetic bag and a 25ml Geranium Purse Spray, housed in a pretty, decorative gift box, with a classic Orla Kiely print. 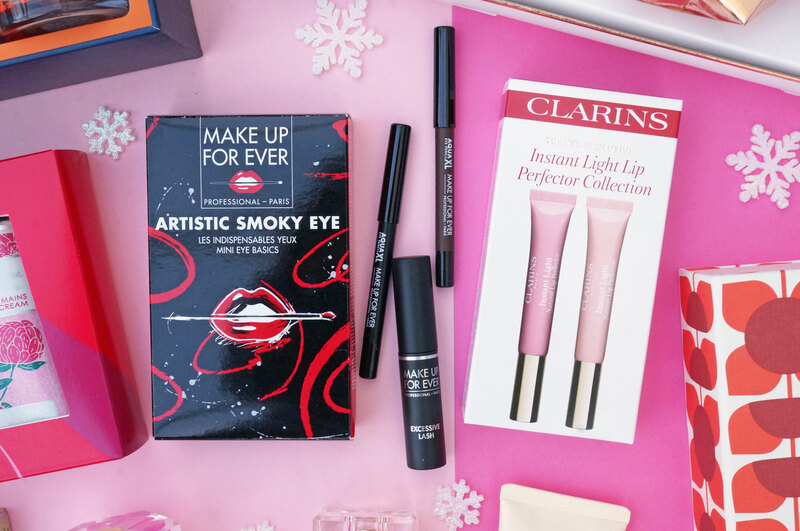 Next, the Makeup Forever Artistic Smoky Eye Kit (£14.00) – this is a fab little gift set containing a selection of Makeup Forever minis. There’s an Excessive Lash Mascara, Aqua XL Eye Pencil in M60 (brown) and also one in M10 (black) – so you can create some gorgeous smoky eye looks this Christmas. If lips are more your thing, the Clarins Instant Light Lip Perfector Collection (£25.40) is a definite must have. I love Clarins Instant Light Lip Perfectors, they leave your lips feeling incredibly silky smooth and nourished, with a natural tint of colour and a glossy shine. This set includes shades 01 Rose shimmer and 02 Apricot shimmer. 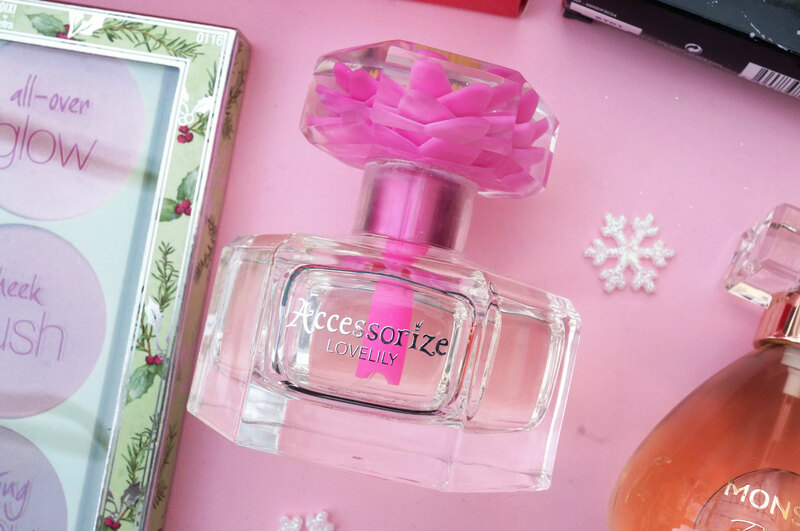 Moving on to fragrance, the brand new Accessorize Lovelily Perfume (£19.00) has recently caught my attention. I have to tell you I’m completely in love with this scent. 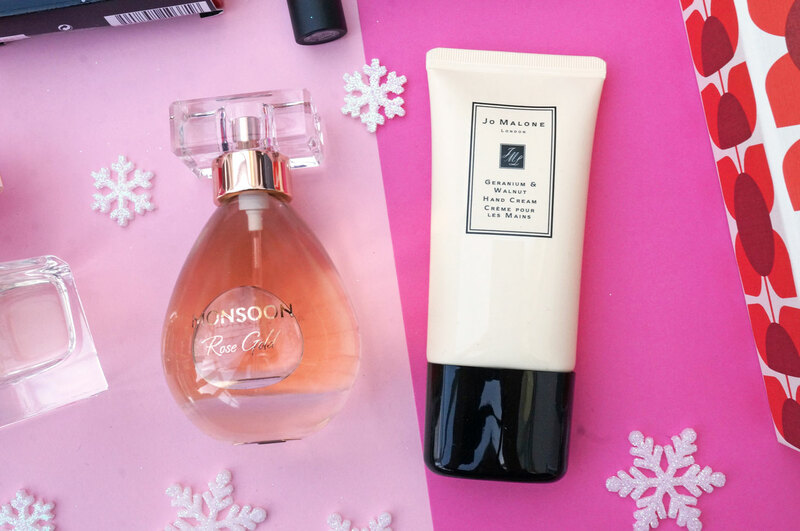 It’s super feminine with notes of raspberry, orange, jasmine and sweet vanilla, and it really reminds me of my youth, I think because it’s quite a young and sweet fragrance. This scent is a fantastic bargain at only £19.00 for 75ml – if I didn’t have this already, it’d definitely be on my Christmas list this year! Continuing with scent, another bargain fragrance is the new Monsoon Rose Gold EDP – which is currently on offer for only £19.33. Rose Gold EDP has top notes of sparkling lemon, soft fruit and ozonic scents, heart notes of velvety rose, tuberose, neroli and cyclamen, and a base of Eastern woods, vanilla, mosses, musk and balsamic amber. This is definitely worth checking out if you’re looking for a new reasonably priced fragrance. And the Jo Malone Geranuim & Walnut Hand Cream (£22.00) – We all know Jo Malone makes some of the best and most beautifully packaged products, but if you’re looking something at the cheaper end of the spectrum, this Geranium & Walnut Hand Cream would make the perfect gift for any Jo Malone fan this Christmas, without breaking the bank. This cream has a lightweight, delicately scented formula including Apricot Kernel oil which absorbs quickly into the skin, leaving hands soft and moisturised. Next the Pixi by Petra Rosy Radiance Palette (£19.00) – I often think Pixi makeup is quite underrated, and this palette is a very reasonably priced considering how much product is included. The Rosy Radiance Palette Rosette from Pixi is an all-in-one colour kit including an array of rose, crème and taupe hues that are able to sculpt and enhance cheeks, add a wash of colour to eyes and fill in sparse brows. 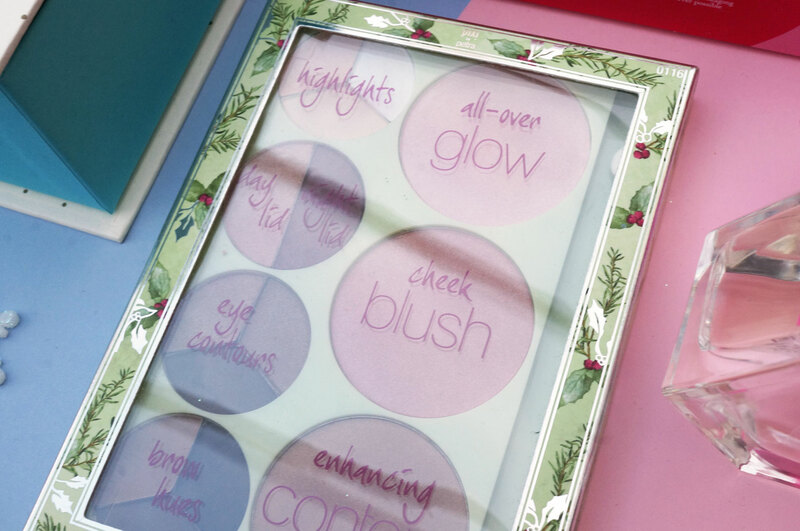 The Palette Contains: 8x Eye Shades, 3x Brow Shades, 3x Face Shades and a Duo Applicator. And lastly, the L’Occitane Delightful Floral Hand Cream Trio (£22.00) – this lovely little set would make the perfect Christmas gift for any L’Occitane fan. It contains 3x 30ml hand creams in scents Cherry Blossom, Arlésienne and Pivoine Flora – which is a real bargain at only £7.33 each! 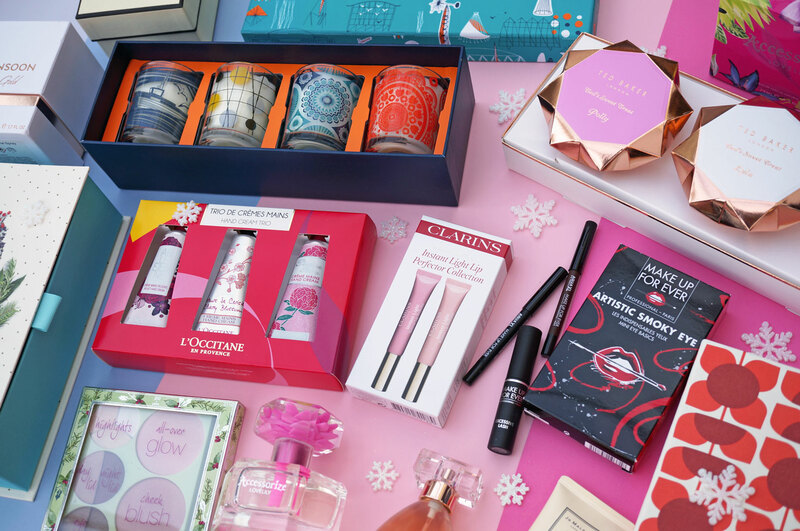 Christmas: L’Occitane Advent Calendar 2016 -SPOILER!